There was a chance that frisbee might be played this morning at Moller Park, so the kids and I walked up the west side of Swan Lake to check it out. I figured in the likely scenario that frisbee was not happening, we could at least get some birding in – see if there was anything of particular interest as we head in to count week for the Christmas Bird Count this Sunday. As it turned out, there were a couple people playing catch, so we joined them for a bit, before continuing on. Rowan was surprisingly interested in birding today, while Connor was much less so. Usually it’s the other way around. Rowan had played on the playground for part of the time Connor and I were playing catch and she opted to go with me along the Path of Hope while Connor decided to play on the playground for a while. I sent her off into the lower brushy area to see if there were any sparrows or thrushes lurking about. She ended up coming up through a (very) minor unofficial trail to try and sneak up on me while I was at the overlook checking out what was on Swan Lake (and there wasn’t much I could see). She wanted to return the way she came, so I went over to the parking for the path of hope – noticing mostly juncos and a few Pine Siskins in the parking lot and at the feeder across the street (earlier Rowan heard then we saw a couple of small flocks flying over – perhaps 30+ birds in all). Walking down the road, Connor came out to meet me, but Rowan still hadn’t found her way out of the forested area. 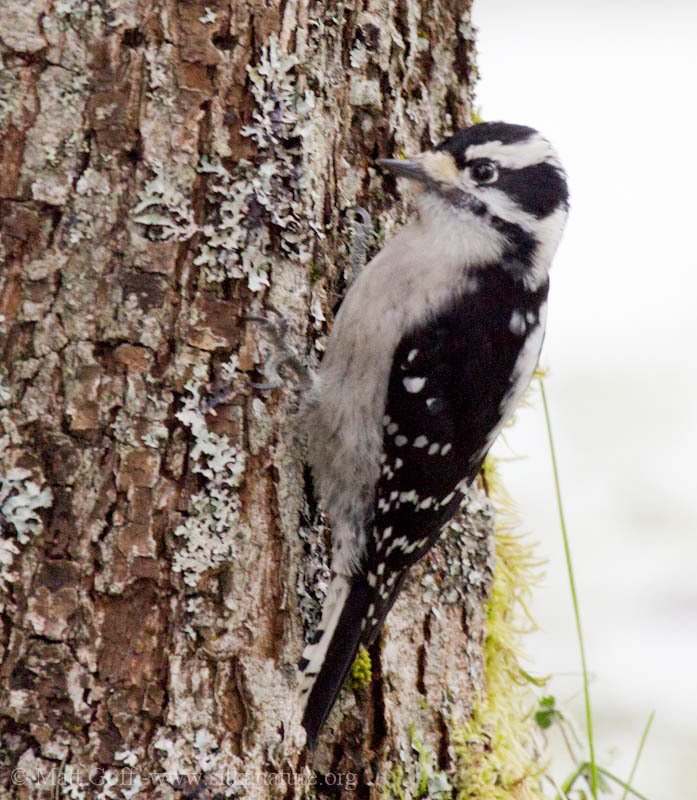 While waiting for her, Connor and I spotted a Downy Woodpecker – a bird I’ve only seen a handful of times around here over the years. I sent Connor to find Rowan so she could see it also, while I tried to take some pictures. The photos didn’t turn out that great, but fortunately it stuck around long enough for Rowan to get a look at it. 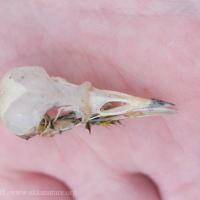 Rowan had found a bird skeleton in the bushes along the ‘trail’ she had been on. She picked up the skull and wanted to pick up some of the other bones, but it sounded like after looking away to get a stick to use, she couldn’t find where the remainder of the skeleton was. 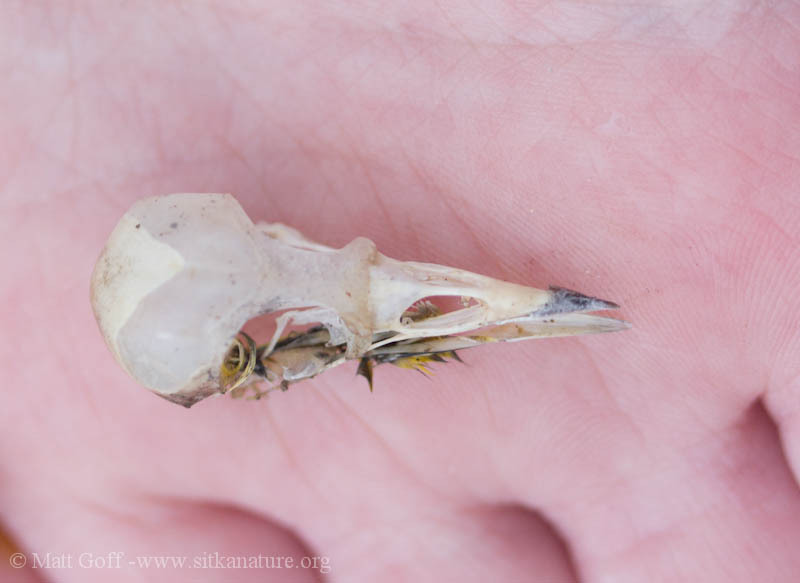 She thought the skull might be a sparrow, but I suggested a warbler was more likely, since there were still yellow feathers associated with it. 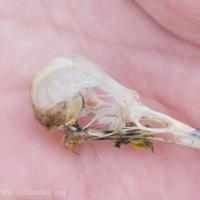 Also, the bill looked better for a warbler, though she and I didn’t talk about that at the time. She carried the skull all the way home so we could keep it. At the time she was talking about trying to figure out what it was by looking in the bird book, but by the time we got home, I think she just wanted to eat lunch, and then forgot about that project. Rather than retrace our steps, we continued around on Cascade Street, then down Lake Street. Connor decided to head on home to start lunch warming up, while Rowan and I stopped to check out the birds on Swan Lake. I was able to count 15+ Ring-necked Ducks, as well as some scaups and mallards near the radio station. 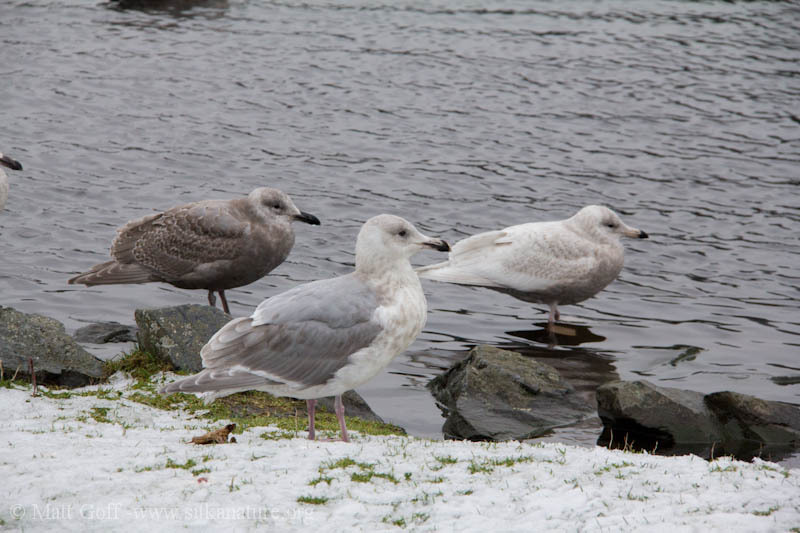 At the peninsula there was the lone Trumpeter Swan, many more Mallards and a few gulls, including the first year Glaucous Gull. 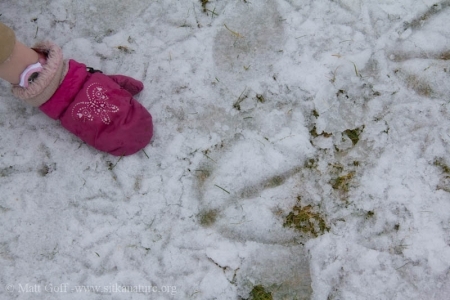 Rowan noticed all the tracks in the snow at the peninsula and said she thought the swan had been walking around a bunch. 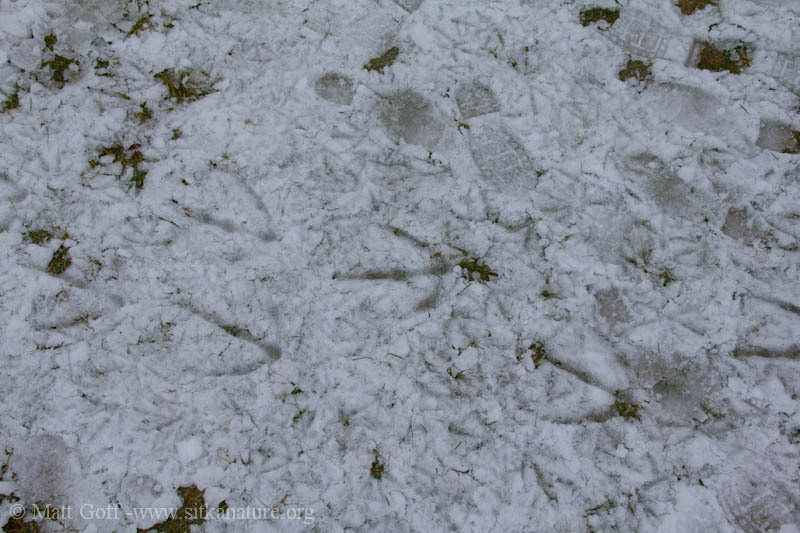 I’m not sure what made her think they were swan tracks instead of gulls and mallards, but she realized the difference when a couple people came and spread some corn out for the birds. 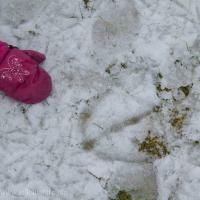 The swan walked over to get some, and then Rowan was able to check out the tracks where she had seen the swan walking. We were both impressed with the size. Overall it was a quiet day – a bit of wind, but not too much, bird activity seemed pretty low, and there wasn’t a lot of precipitation. What did fall was kind of a heavy wet snow, but there wasn’t enough to add any depth to the thin ground covering that we got overnight. 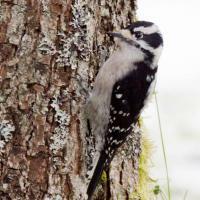 This Downy Woodpecker foraging on trees near Moller Park. 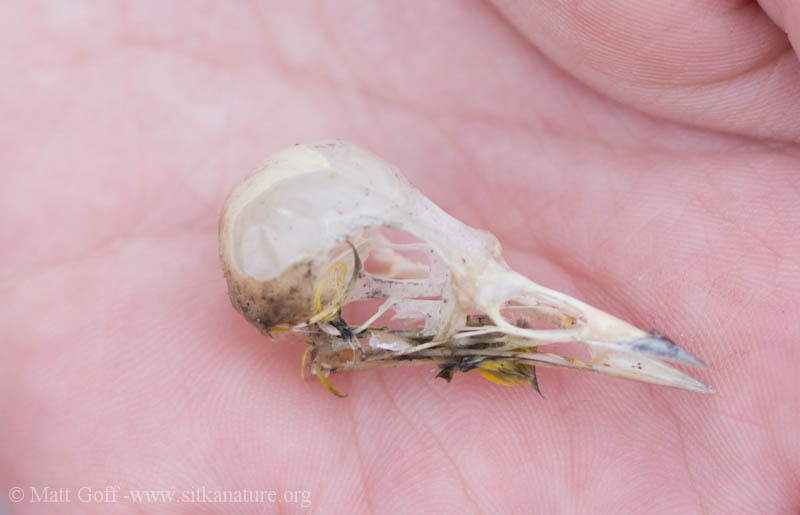 Rowan found this bird skull (probably a warbler) in brush near the Path of Hope. 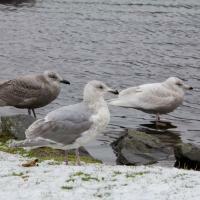 Two Glaucous-winged Gulls and a Glaucous Gull at Swan Lake. 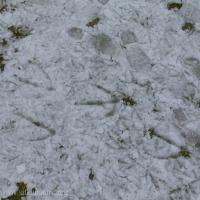 Trumpeter Swan tracks in the snow at Swan Lake. This entry was posted in birding, birds, kids and nature, photojournal, tracks and sign, weather and tagged Connor, dark-eyed junco, Downy Woodpecker, Mallard, Path of Hope, Ring-necked Duck, Rowan, Swan Lake, Trumpeter Swan. Bookmark the permalink.